Martinez Environmental Group: Do you like trains a lot? I just did a presentation as part of the Martinez Environmental Group Community Forum held here in town Sept. 8. My focus was on some trends and projections for crude-by-rail (CBR) nationally, statewide and locally. Then it hit me that there were aspects and implications I had not fully appreciated. Of course, the safety record doesn’t look good. A 2013 spike in CBR traffic nationally led to consequent spikes in accidents and spills. In fact, more CBR was spilled in this country in 2013 than in the previous 40 years combined. The sheer volume shipped can mask what is actually happening. A projected 7.7 billion gallons of crude is expected to roll into our state annually by 2016. That makes a mockery of the rail industry’s oft touted 99.99 percent safety record, a record based on volume shipped. Shipping that much volume into the state allows for the spilling or otherwise loss of over 766,000 gallons a year without even breaking a statistical sweat. You bring it, the accidents will come. The rail companies are actually having accidents about once a week now. Two locomotives derailed in Benicia Monday. Third derailment there in the last 10 months. Hey, stuff happens. I did my walk in the Marina Park this morning. Saw two freight trains go by, one from the north, one from the south. The one from the south had five or six locomotives pulling about a hundred hopper cars. From my vantage, I couldn’t tell if they were loaded. The train easily spanned the entire Carquinez trestle. We’ve seen the same thing lately with 100-car trains of ethanol heading through downtown. It struck me. Just how many trains do go through downtown Martinez on a given day, or at least take up room on the Union Pacific (UP) and BNSF rail corridors that bracket Martinez? The Amtrak guys at the station told me they have 42 trains a day. Forty-two! That’s almost one every 30 minutes. All but two of those travel the UP rails to Sacramento through Benicia, Suisun and Davis via the Union Pacific tracks that will also carry most of the crude oil trains into the Bay Area. Add in the freight trains. Amtrak couldn’t tell me anything about them, said they’re unpredictable. Well, I saw two within the space of an hour. Add in the projected oil train traffic. We do know that one unit train (100- cars) of Bakken crude travels the BNSF line from the east along the Highway 4 corridor, over the Muir trestle into Franklin Canyon every seven to 10 days. I don’t know what other trains use that route. 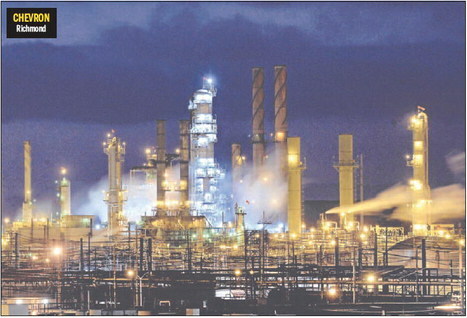 If all of the regional refinery proposals are allowed, we could also see a unit train a day travel through downtown on its way to the Phillips 66 refinery in Santa Maria near San Luis Obispo. WesPac in Pittsburg wants a unit train a day. Valero in Benicia wants 100 cars per day. Add ‘em up and you’re looking at 20 trains, 2,000 cars, 60 million gallons a week impacting our region, kludging up the rails, slowing other freight and passenger traffic, not to mention complicating the mix with highly volatile and toxic cargoes. Each unit train is over a mile long, weighs over 28 million pounds and carries about 3 million gallons of oil. Remember, for each one coming in, there has to be one going out. I think that’s one of Newton’s laws of motion, but I could be wrong. Anyway, so double the number of unit trains: 40 a week by 2016. Add in 294 AMTRAK trains per week, and a conservative estimate of 28 other freight trains a week (4/day). Total: 362 trains per week, each blowing its whistle three of four times at each crossing. Every 30 minutes. So I hope you like trains a lot. This morning [Thu/4], at 7am in Richmond, Calif., four environmental activists used U-locks to fasten themselves by the neck to the fence of an oil shipping facility operated by Kinder Morgan. They were interlocked with another four activists, who had their arms secured with handmade lock-boxes. “I’m locked to a lock box connected to my partner, Ann, who is locked with a U-lock to the fence,” Andre Soto, of Richmond-based Communities for a Better Environment, explained by phone a little after 8am. At that time, Soto said several Richmond police officers had been dispatched to the scene and were calmly surveying the human barricade. He wondered out loud if they would be arrested. The environmentalists risked arrest to prevent trucks from leaving the Kinder Morgan facility for area refineries with offloaded oil shipped in by train. Crude-by-rail transport at Kinder Morgan’s bulk rail terminal, located in the Burlington Northern / Santa Fe railyard in Richmond, is the subject of a lawsuit filed in March by Earthjustice on behalf of the Sierra Club, Communities for a Better Environment, the National Resources Defense Council, and the Asian Pacific Environmental Network. The suit, targeting Kinder Morgan as well as the Bay Area Air Quality Management District (BAAQMD), charges that Kinder Morgan was illegally awarded a permit for crude-by-rail operations without going through a formal environmental review process, which would have necessitated public hearings and community feedback. The case asks for operations to be halted while the project undergoes review under the California Environmental Quality Act. A hearing will be held in San Francisco Superior Court at 1:30pm tomorrow. Ethan Buckner of Forest Ethics, who was also locked to the fence, said activists were especially concerned that the crude oil being shipped into Richmond, much of which originates in North Dakota, was volatile, presenting safety concerns. “The oil trains are … very old tank cars that are subject to puncture, and have been known to fail over and over again while carrying oil,” Buckner said. Much of the oil shipped into the Richmond transfer point by rail originates from the Bakken shale region, which has been dramatically transformed by the controversial extraction method known as fracking. In the end, none of the activists were arrested. They voluntarily unlocked themselves from the fence and left the railyard around 10am. “After three hours we decided thsat we had made our point,” Eddie Scher of Forest Ethics said afterward, speaking by phone. Along with a group of around ten others participating in the civil disobedience action, the activists who locked themselves to the fence were affiliated with Bay Area environmental organizations including 350 Bay Area, the Asian Pacific Environmental Network, the Sunflower Alliance, the Martinez Environmental Group, and Crocket Rodeo United to Defend the Environment. Reached by phone, Ralph Borrmann, a spokesperson for BAAQMD, said, “We have no comment on the current litigation, or any actions relating to it.” He added that more information would come out during the Sept. 5 hearing.